Automakers are becoming mobility companies, which means they are acknowledging that the next generations of consumers aren’t necessarily interested in actually owning what automakers make. And, as more cities become more Sao Paolo-like as mega-metro areas, traffic and parking will be less onerous than they are now. Ford Motor, which in January launched the Smart Mobility Plan, a global program that funded some 25 transportation and telematics commerce research and product experiments in different countries, is narrowing its focus on pilot programs to test flexible ownership, and multimodal urban travel. The first involves peer-to-peer ride sharing. Ford Credit is inviting up to 14,000 prescreened customers in six U.S. cities and 12,000 in London to sign up to rent their Ford Credit-financed vehicles for short-term use. That, says Ford, will help them offset monthly vehicle ownership costs. 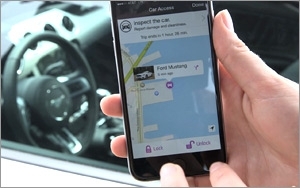 The automaker said the program is powered by a partnership between Ford Motor Credit Company and Getaround in the U.S. and easyCar Club in London. Ford cites research from independent firm Penn Schoen Berland that says a third of Millennials in the United States are interested in renting out their own belongings as a way to supplement their income; and these consumers rank car rides second only to book lending as things they are most open to sharing. More than half of Millennials reported being open to sharing rides with others. Also, half of Millennial and Gen Z consumers said money savings was the top advantage to sharing goods and services. Ford is looking at bicycles as a way to extend mobility beyond four wheels. The new electric MoDe:Flex electric bicycle, the third Ford has introduced since March, folds so as to be stored in (ideally) a Ford vehicle, where it can also be charged. The bike is paired with a mobile app, including one for smartwatches, that gives weather, congestion, parking costs, time, traffic and public transportation info. It includes eyes-free navigation, route planning, and health and fitness information, per Ford.